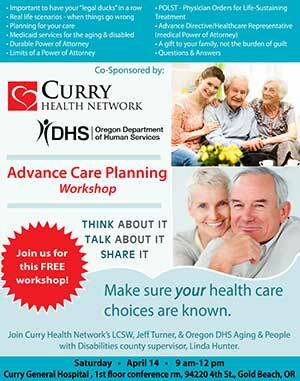 April 14 - Join us for a free Advance Care Planning workshop. Make sure your health care choices are known. It's important to have your "legal ducks" in a row. Learn about POLST, advance directive, durable power of attorney, planning for your care, and Medicaid services for the aging & disabled. Discuss real life scenarios - when things go wrong. Give a gift to your family, not the burden of guilt. This free workshop is co-sponsored by Curry Health Network and Oregon Department of Human Services, and is being held from 9 a.m. to noon on Saturday, April 14 in the conference room of Curry General Hospital at 94220 4th Street in Gold Beach. Join Curry Health Network's LCSW, Jeff Turner, and Oregon DHS Aging & People with Disabilities county supervisor, Linda Hunter for this important and informative workshop. Bring your parents. Bring your adult children. Bring your friend or neighbor, or just come to learn and for your own peace of mind. Advance Care Planning - Learn how to make sure your health care choices are known.